Be fire-safe! Maintain at least a minimum 2" clearance (air space) to combustibles. Use proper support and bracing. Follow local building codes and have your chimney inspected by a certified professional. DVL/DuraBlack Chimney Adapter must be used when connecting DVL pipe to a ceiling support box or finishing collar. When connecting DuraBlack pipe, a DuraBlack Slip Connector or Snap-Lock Adapter must be used. Wall Thimble must be installed with an appropriate length of chimney pipe for all horizontal through-the-wall installations. To accommodate thicker walls, the telescoping pieces can be separated, and a field-fabricated extension may be installed. Attic Insulation Shield must be used in all installations that pass through an attic, regardless of the attic insulation. 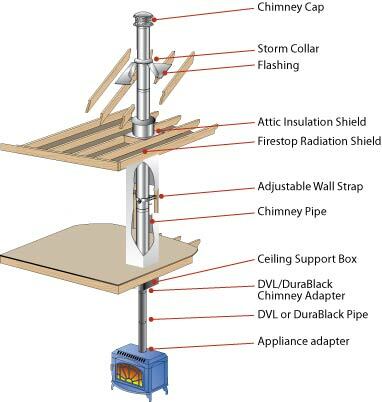 Firestop Radiation Shield must be used when a chimney passes through a floor or ceiling without a support box. Below you will find a two illustrations for how to install a DuraTech Insulated Chimney Pipe. They both illustrate a typical DuraVent through the ceiling installation. The first illustration includes the chimney cap, wall strap, tee with cap, wall thimble, adapter and tee support. The second illustrates the chimney cap, storm collar, flashing, attic insulation shield, firestop radiation shield, adjustable wall strap, chimney pipe, ceiling support box, DVL/DurBlack chimney adapter, DVO or DuraBlack pipe and an appliance adapter. NOTE: Wall bands are recommended every 6 feet. XpressFireplaceStoves.com is a Duravent Approved Internet Seller.